The 3-time major winner had been the favorite to succeed Dane Thomas Bjorn for the defense in Wisconsin, after having served as vice captain at the last three Ryder Cups. 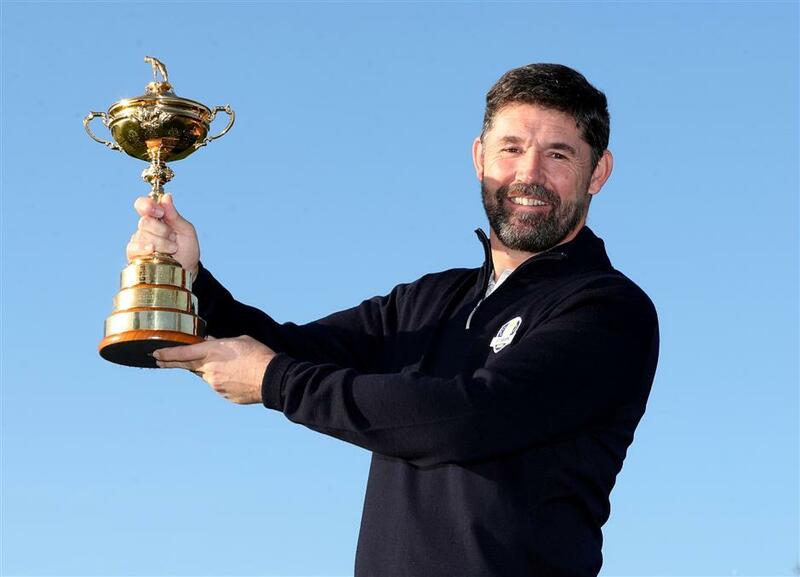 Padraig Harrington poses with the Ryder Cup after being appointed as the European captain for the 2020 Ryder Cup, at the Wentworth Club in Virginia Water, Britain, on Tuesday. Ireland's Padraig Harrington was named Europe's captain for the 2020 Ryder Cup on Tuesday, less than four months after helping the team to a crushing victory over the United States in Paris. The three-time major winner had been the clear favorite to succeed Denmark's Thomas Bjorn for the defense at Whistling Straits, Wisconsin, after having served as vice captain at the last three Ryder Cups. Harrington, who won back-to-back British Opens in 2007 and 2008 before going on to win his third major at that year's PGA Championship, also played in six successive Ryder Cups from 1999 to 2010, helping Europe to four victories. "It's not something I take on without a certain amount of trepidation," he told a news conference at the European Tour's headquarters at Wentworth. "I have played under, and been involved with, many wonderful European captains since I made my debut in the contest 20 years ago, and I would like to think that my captaincy will be a mix of all of them." Harrington is the third Irish captain of the Europe team in the last four stagings of the match. Paul McGinley successfully captained Europe at Gleneagles in 2012, while Darren Clarke lost out on American soil at Hazeltine in 2014. McGinley and Clarke were among those in a five-man committee to select the captain for Whistling Straits. The Irishman became the favorite after England's former world No. 1 Lee Westwood, one of the five European vice captains in 2018, indicated a preference to do the job in Italy in 2022 when Rome hosts the event. Several key Europe players, including Northern Ireland's Rory McIlroy and England's Justin Rose, had given Harrington public backing to lead the team in their title defense. Harrington is also an experienced hand on the Wisconsin course, which hosts the Cup from September 25 to 27 next year, having played there in the PGA Championships in 2004, 2010 and 2015. The 47-year-old has not won a European Tour title since his Portugal Masters triumph in 2016 but came close at the Czech Masters last August, finishing second in what was his best performance of the season. Bjorn's side put on a ruthless display while outplaying the United States in a 17.5-10.5 victory at Le Golf National in September last year.